(1). Toothpaste is racist because it encourages people to get their teeth white. (2). 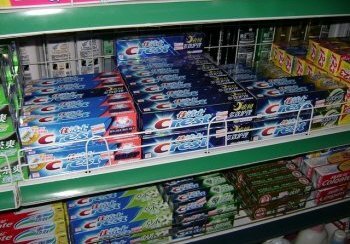 Most toothpastes are white. (3). Even though there are some toothpastes that come in other colours, it eventually gets white in your mouth when you use it. (4). There are no black, brown or yellow toothpastes. (5). Why must all people have white teeth? (6). Why is only a white smile called a “healthy smile”? (7). Are people with white teeth somehow greater that those with yellow teeth? (8). If having white teeth is so great, why is it that some people eventually lose their teeth when they get old? (9). Why all the emphasis on the “whiteness” of the teeth with regards to toothpaste and oral health? (10). The fluoride in toothpaste is dangerous and it was put in there to slowly kill minorities. I want this printe on a t-shirt. Enjoyed it.